The project partners of “Nanostructured self-assembled functional materials” (‘NanoFun’) held their first meeting on 16th February, at NWO in Utrecht. In the morning the outline of the project was discussed. In the afternoon the four present companies, ASM, Continental, Tata Steel and Philips SCIL Nanoimprint Solutions and the involved universities presented their expertise regarding the content and their role in the project. The first three researchers have started in the program in the last quarter of 2017, a Post-doctoral researcher at the University of Groningen and a Ph-D student and a Post-doctoral researcher at Eindhoven University of Technology. In a Chemical Industrial Partnership Program (CHIPP) NWO CW links academic knowledge to industrial ambitions by executing pioneering chemistry research in collaboration with companies. The key objective of the NanoFun program is to develop novel concepts – based on self-assembly – for nanoscale tailoring of structured materials. This will provide superior levels of performance and/or additional features compared to existing materials. The project aims at developing self-organizing (nano-) materials with the ability to form larger structures, thereby yielding unique material properties for a variety of new and existing technologies. The outcome of this fundamental research program can have influence on technology we use in our daily lives: car tires with lower rolling resistance, saving a lot of fuel; new underwater paints reducing maintenance for boats; more powerful smart phones and highly efficient solar panels. By developing ‘self-assembled’ materials that spontaneously emerge from small building blocks, such applications are within reach. 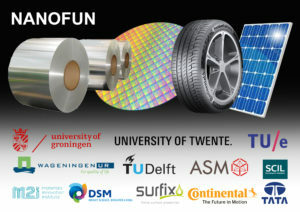 Within the NanoFun program, M2i and NWO collaborate with ASM, Continental, Tata Steel, Surfix, Philips SCIL Nanoimprint Solutions and DSM. The participating universities are University of Groningen, Eindhoven University of Technology, Delft University of Technology, Wageningen University and University of Twente. Professor Katja Loos (University of Groningen) is the scientific program leader. The project management is carried out by M2i.